I've picked a mini library for this week's theme as it contains everything like words, signs, books, magazines, paper, etc. 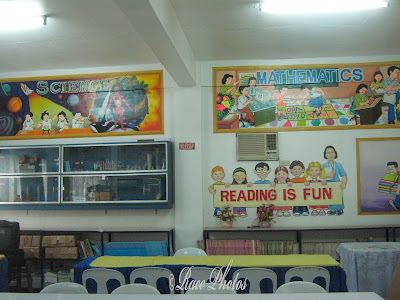 What I like best in this library are the murals at the top showing all subjects being studied in the school like English, Math, Science and more. Al subjects are there surrounding the room. I love also the drawing saying 'Reading is Fun' which encourages young students to make reading not only a must in studying but a hobby as well. At the side of it there's a painting of a man carrying heavy load of books. I just find this library an attractive one for the kids. See more Thursday Challenge 'Writing' entries here!